Which Credential is Right for Me? Increasing numbers of hospitals, physician offices and other healthcare organizations require their coding staff to become certified to demonstrate coding proficiency. Knowing which credential is right for you can be a challenge. Before sitting for any coding credential exam, coders should make sure they have prepared adequately and have the prerequisites necessary to ensure success. Careful and thorough exam preparation is key! Libman Education’s Coding Credential Exam Reviews and Coding Credential Exam Preps prepare coders to successfully sit for these exams. The CCS coding credential, offered by AHIMA, demonstrates mastery-level coding skills, generally in a hospital setting. A minimum of two years hands-on acute-care hospital coding experience (both inpatient and outpatient) is strongly recommended before attempting the CCS. Learn more about Libman Education’s CCS Exam Prep, CCS Exam Prep for CDI, CCS Exam Review, and CCS Mock Exam. 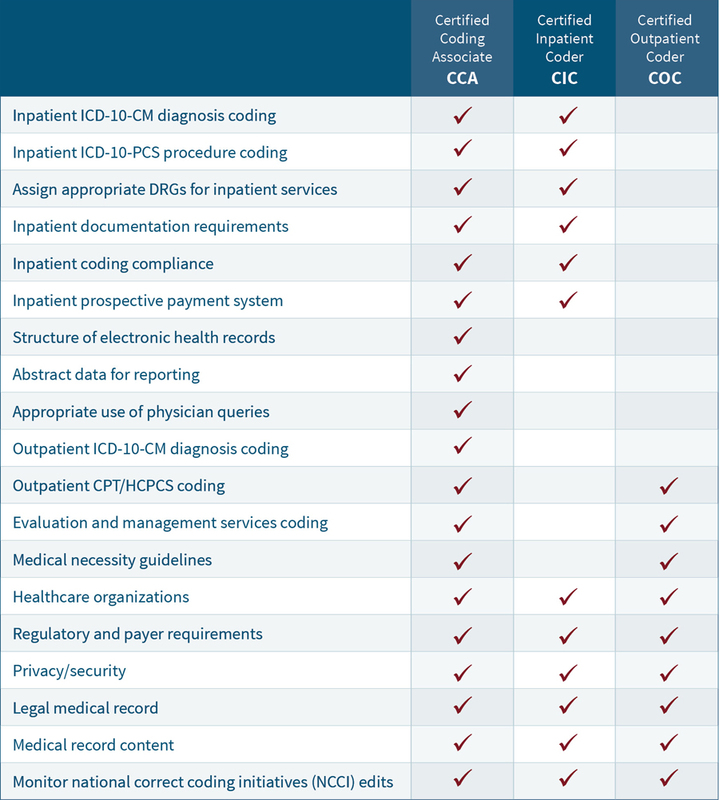 The CCA coding credential, offered by AHIMA, demonstrates proficiency in assigning accurate medical codes for diagnoses, procedures and services in all settings, including hospitals (both inpatient and outpatient) and physician practices. Learn more about Libman Education’s CCA Exam Review. The CIC coding credential, offered by AAPC, demonstrates proficiency in assigning accurate medical codes for diagnoses, procedures and services performed in the inpatient setting. Learn more about Libman Education’s CIC Exam Review. The COC coding credential, offered by AAPC, demonstrates proficiency in assigning accurate medical codes for diagnoses, procedures and services performed in the outpatient facility setting. Learn more about Libman Education’s COC Exam Review.